After attending a panel by WebRoots Democracy on ‘Intersectional Suffrage’, it got us thinking more about accessible voting. Even as we celebrate the centenary of some women getting the right to vote, it’s still not always the easiest process, particularly for disabled people. The UK government estimates there to be 11 million disabled people in Britain, so making sure you cast your ballot can hold significant sway in elections. According to research by the Electoral Commission, disabled people were less likely to consider the last general election to be ‘well-run’ than those without a disability. In addition to this, there were reports of disabled people being turned away from the polling station because they couldn’t get in, or they were made to feel uncomfortable for being there. In the hopes of further supporting disabled people and the people around them, we’ve compiled some resources on accessible voting below. 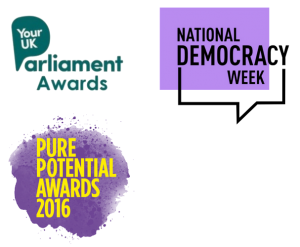 Though we recognise that more needs to be done to ensure disabled people can fully participate in our democracy, and that disability is as diverse as the people it affects, we hope the resources below can empower more disabled people to vote. In order to cast your ballot, you first need to register. You can check with your local electoral registration office (https://www.gov.uk/get-on-electoral-register) to see if you are already registered. If not, you can register online through the government website (https://www.gov.uk/register-to-vote). Some areas also allow you to register by phone, so contact your local electoral registration office to see if they offer this service. Remember you will also need your National Insurance number to register to vote. In the 2017 General Election, the government produced an easy read form for registering to vote. Contact your local electoral registration office to check if they will accept this form. 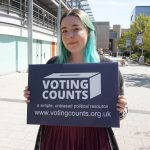 The learning disability charity Mencap also created an easy read guide to registering to vote and voting if you need more information on this. Once you have registered to vote, you might decide that you want to vote by post rather than in person. To do this, you will need to fill in a form and send it back to your local authority, you will then receive your ballot paper by post. If your postal vote is delivered by 10pm on polling day, it will be counted in the election. The form for applying to vote by post requires a signature, if you are unable to provide this you can request a signature waiver from your local electoral registration office (https://www.gov.uk/get-on-electoral-register). If you can’t vote in person, another way to vote is by proxy. This means to nominate someone else to vote at the polling station on your behalf. There are a few different forms available for voting by proxy, such as for a particular election or referendum or for people applying to vote by proxy because of their disability. As with applying for a postal vote, this form requires a signature. If you are unable to provide this, apply for a waiver from your local electoral registration office (https://www.gov.uk/get-on-electoral-register). If you decide you want to vote in person, the Electoral Commission states that polling stations must make reasonable adjustments for disabled people to access them. If you’re worried you may have trouble accessing the polling station or you have any questions about accessibility, contact your local electoral registration office (https://www.gov.uk/get-on-electoral-register). Polling stations should provide low-level accessible booths for wheelchair users and you can request ramps for access into the building if they are not already available. A tactile voting device should be available at every polling station to ensure those with a visual impairment are able to cast their ballot. Large print versions of the ballot paper are also available at every polling station, although you cannot vote on this version, but you can use it for reference. The Electoral Commission have produced an accessibility checklist for polling stations (word doc) so you can know what you are entitled to. If you need assistance to help you mark the ballot paper, you can request the assistance of the Presiding Officer who is present at the polling station. Alternatively, you can bring along someone to help you. This person must be over 18, and either an immediate family member or someone who is registered to vote themselves (also called a ‘qualified elector’). For example, if you have a support worker who is registered to vote themselves, they can assist you in marking the ballot paper. If you want to know more about your right to vote as a disabled person, the Electoral Commission has compiled a useful list of your rights.